Doll Collectors treasure the doll art created by the world-renown doll artist Helen Kish. She rewards her collectors every year with new beautiful and innovative collections. In 2011 collectors had the option of Helen Kish hand-painting their new doll! 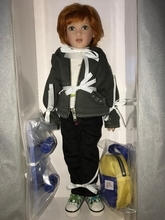 They were able choose either the usual high quality manufactured dolls or for the extra sum of $75 they were able to have their doll hand-painted by the artist herself - certification and numbering included.